There is an abundance of peppers growing in my garden, so much so, I can barely keep up with using them. I’ve frozen some, made salsa, incorporated them into sauces and meals and even-handed them out in little brown bags to the adults during Halloween (I seriously have that many!). I felt like I was running out of ideas on how else to use these Serrano, until I ran across a jar of pepper jelly in my fridge and was inspired to make my own homemade jelly. Have you ever tried Pepper Jelly? It doesn’t matter if its blended with berries, or stone fruit or just sweetened with sugar, they are all pretty delicious. The first time I remember ever trying a jelly like this was at a Christmas party. The hostess prepared an adorable plate of crackers and this pretty block of cream cheese was dressed in bright red jelly. I had never seen or even tried anything like that before. I remember thinking how simple it would have been to prepare and yet it still seemed fancy. Maybe it was because it was displayed so beautifully but I think a lot of it had to do with the flavor combination …. it was delightful. 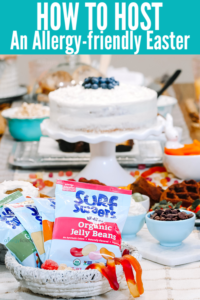 There was the crunchy and slightly salty taste of the crackers, the creamy and cooling taste of the cream cheese and then the spicy and sweet burst of awesomeness from this jelly. Talk about an easy way to impress your guests. 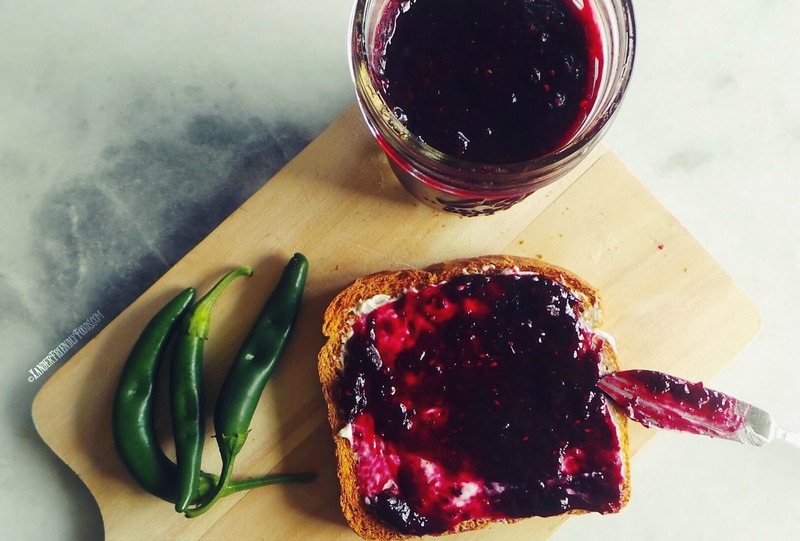 Now, of course you could go ahead and buy some store-bought brand of jelly and present it at the table during this years holidays or any other social gathering OR you can make your own Pepper Jelly made with organic mixed berries and REALLY impress your guests. It quite honestly was so simple to do and took less time than running to the store to pick up a jar of someone else’s preserves. It really just starts with the berries. Since have been unsuccessful at growing any in my garden, a bag of frozen mixed berries worked out just perfectly, so don’t freak out if you don’t have any fresh ones on hand. Simply cook them down in a large pot with your lemon juice. They will defrost and their natural juices will start coming out. I just make sure to watch and make sure nothing boils or burns. Once it has simmered about 20 minutes, add your diced Serrano. Include the seeds if you can handle a little more heat :). 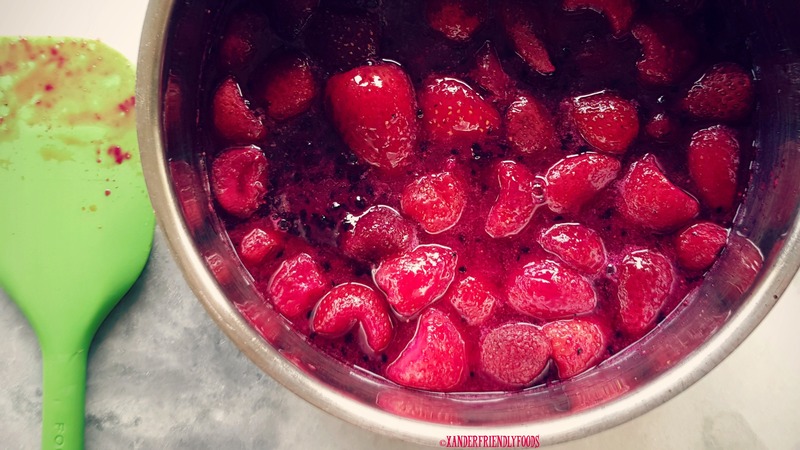 Once everything has simmered about 5 minutes longer, use an immersion blender (or carefully pour berries into a blender) and pulse to the consistency you prefer. I like to leave just a few bits of berries to add texture but stay away from leaving big pieces of fruit or peppers…. because no one really likes chunky jelly. You are so close now! Add in your sugar and thickener and let simmer about 15 minutes. I used Pectin for this recipe because I wanted to try something new. I’m so glad I did, because it wasn’t as intimidating as I had thought. 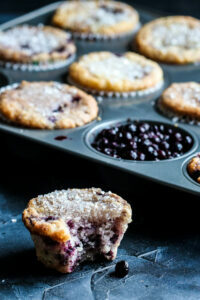 All you need to do for this recipe is mix 2 tablespoons of fruit pectin with the sugar and mix it into the berries. It will thicken as it simmers and then a little more as it cools. Cornstarch or agar powder is another option if you’d like it to be a little thicker (like jam). For that, I would start with 1-2 tsp of either, mixed into equal parts of warm water in a separate bowl and then add it to the pot while simmering. It will also continue to thicken as it cools so don’t overdo it. 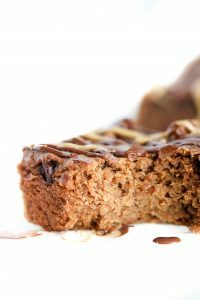 This really does taste fantastic over some Vegan cream cheese. If dairy isn’t an issue for you or your family, maybe try with some goat cheese or brie. Usually I have crackers on hand but how awesome would this taste on these Gluten-free Biscuits from Sharon @ What The Fork? I may just have to have some right now! 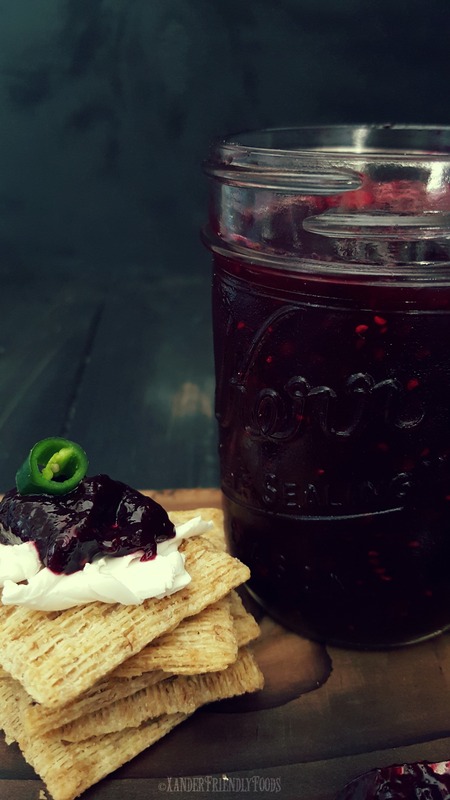 Sweet with heat, easy to make, Mixed berry & pepper jelly. Pairs perfectly with cream cheese covered crackers for your upcoming holiday or celebration. In a large saucepan, cook down berries with lemon juice over low for 20 minutes. In a small bowl, mix together sugar and pectin. Set aside. Stir in your diced Serrano peppers to the simmered berries. Using an immersion blender (or transfer to blender of choice), puree berries and peppers to a smoother consistency. Add sugar mixture and stir to incorporate. Keep at a low simmer for approximately 15 minutes. Remove from heat and allow to thicken as it sits. Cool completely before transferring jelly into glass jars. *If mixture is too thick, add in filtered water, 1 TB. at a time. 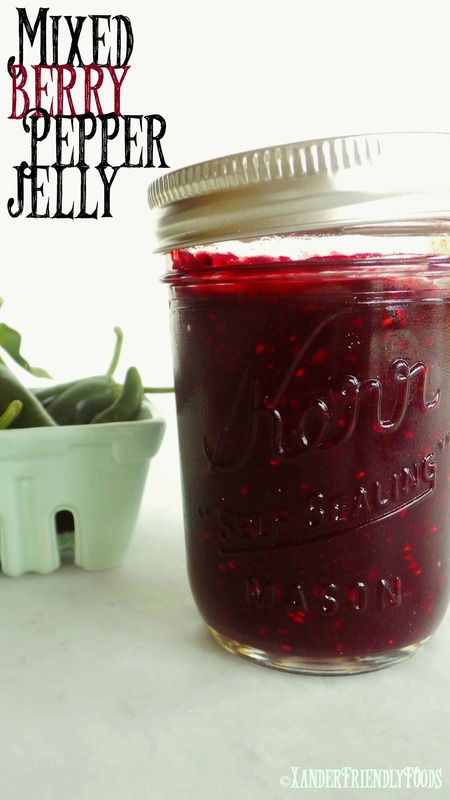 If jelly seems too watered down (based on fruit/water content), mix 1 tsp. of pectin with 2 TB. water then add to berries. Stir and allow to thicken some more. gifts and wanting them to last for my friends and family.. So glad to hear you are making these. And no, I didn’t have to do a jar bath. Super easy without the whole “canning” experience. I made this yesterday and I have to say it was disappointing. The texture was perfect but it lacks any sweetness to offset the peppers. Maybe if I’d have used regular cane sugar it might have been a bit sweeter? I won’t be giving out this item. Happy other’s outcome were different. I’m sorry to hear it didn’t turn out for you. 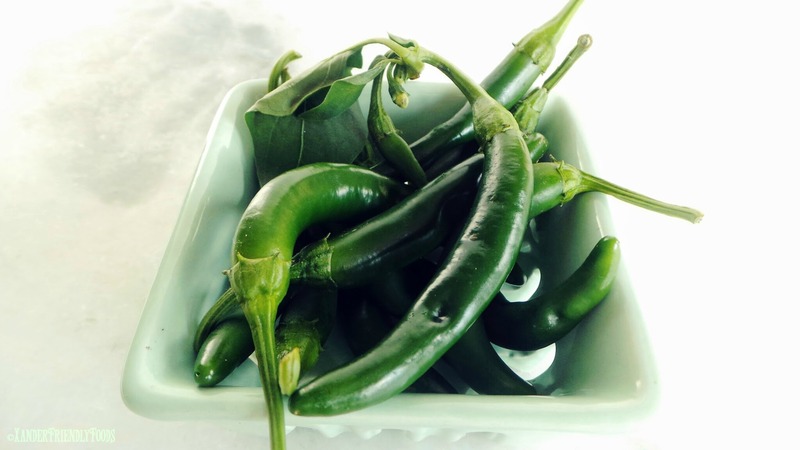 Did you use serrano peppers? With or without seeds? Just trying to check all variables. I would try reheating the jelly and adding more sugar to the recipe, ideally going up to 1 1/2 cups, tasting as you go. It should still set but you may need to add another teaspoon of pectin. It’s worth trying before throwing it out. Let me know if that works for you.